The ‪#‎MAVEN‬ navigation team successfully performed a period correction maneuver on Wednesday, August 12, which increased the orbital period of the spacecraft to 4 hours & 38 minutes. This maneuver was performed in order to keep the spacecraft within the required science corridor. 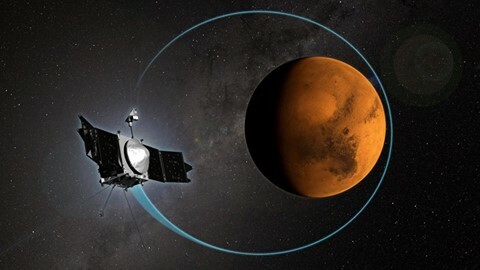 The maneuver was necessary because there is drag or an aerobraking effect exerted on the spacecraft during periapsis (lowest altitude), when MAVEN enters a more dense region of the ‪#‎Martian‬ atmosphere, which can reduce the orbital period. This effect is especially pronounced during the deep-dip campaigns, where the spacecraft flies through a density corridor during periapsis that is twenty to thirty times the atmospheric density encountered during normal science operations. As a result of the period correction maneuver, which had a ∆V (change in velocity) of 31 m/sec, the apoapsis (highest altitude) of the spacecraft is now 6,508 km from the surface of ‪#‎Mars‬ and the periapsis is 147.5 km. The 4th deep dip campaign is on schedule and will begin with a walk-in maneuver on September 2nd.